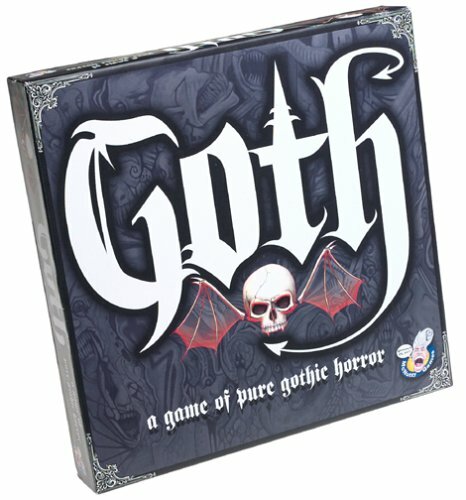 Goth: a "game of pure gothic horror"
Goth is a boxed board game that contains 200 cards, with 5 questions per side, so 2000 total questions. Goth is to be played by 2-4 players or teams. There are only 4 "graveyards" on the board, so you can't go over 4. You place a tombstone in your graveyard for each question you answer correctly. Naturally, the starting point for each player is a pool of blood located right by his/her graveyard. The first person or team to acquire 13 tombstones wins. It's of course not that simple, though. You can land on certain flagstones during the course of the game (you roll a die each turn and maneuver around the cemetery that IS the game board) that cause you to "die" (lose a turn), "grave rob" (steal a tombstone from another player or team), and do other funky things. If you land on your pool of blood or another player/team's pool of blood, that also has an effect. I dig this game (no pun intended). Their efficient use of space on the cards allows them to give you quite a few questions. All questions relate to death, macabre & other dark things in one form or another. Suicides, death/heavy metal bands, stories by Poe & others, horror movies, comic books, mythology, embalming practices and much more are in here. You'll even find a number of "mainstream" names and subjects, but the questions always involve death or darkness it some way. For what ages is this game appropriate? Hard to say. McNutty Games suggests it's just for adults, but I found no profanity or anything else offensive, once you get past the game's primary subject matter, of course. I have played Goth with a few folks, and we generally enjoyed it. You will get some questions that are quite obscure and that only goth chics and goth dudes are likely to know, but some fairly general stuff as well. I took this game to our local monthly Mensa game night recently, and put this in front of the standard trivia gurus. It was fun to watch Cliff, a non-Mensan (but by no means a dummy, y'all) who had never played Goth before, but who has more than average "gothic knowledge" get many of the questions right that stumped the regular Trivial Pursuit champs. This would be a great Halloween game. Goth games have been known to last a bit long, so you might try playing until someone gets 7 tombstones vs. the standard 13. You can find Goth online for purchase here.